Are meetings something that you would consider magical at your organization? No? Why not? Aren't meetings a place to collaborate, share ideas, dream big dreams and then make things happen? Communication methods are imperfect as a whole. While you can create a business plan via a series of emails, it's inefficient and the plan will often lack creativity. The same goes for one-on-one meetings. Team meetings are the ideal way to build energy and enthusiasm for a new idea and generate actionable outcomes, but without the proper structure, even these meetings can be considered wasted time. No, you shouldn't begin with 'What will it take to fill an hour of team meeting time this week? ', because if that's your first thought then you're already sunk. Request that team members send agenda items at least 24 hours before the meeting time and consolidate them to form your agenda. Keep in mind the flow of topics, and be sure you're leaving time for strategic conversations. Leave items that may fall into deep tactical minutiae to the end of your agenda. Consider the consensus that you're attempting to build with your meeting, or what your takeaway should be. Perhaps you need someone to volunteer for a new project, or you just need to inform a group about a direction that will impact their work. If you feel that there may be some pushback to your ideas within the room, look for a partner who will be in the meeting who can help support your point. If an item that was on your agenda doesn't have a clear actionable, add it to a parking lot for a later date. Time is money, and never is that more true than when you have 3-15 individuals in a room together meeting without a timeline or agenda. Based on your agenda, break down how long each portion of the conversation should take and allot time accordingly. If your meeting should only need 23 minutes, then schedule that much time -- perhaps plus a few minutes extra. Be a stickler about keeping conversations in check and moving the agenda along to hit key points in your list. Just need to chat with a few people about a simple topic? Instead of finding space and time for a full-fledged meeting, consider a 5-minute drive-by or stand up meeting. Grab a few people and huddle around a desk or common area, hash through your questions or concerns and let everyone get back to their day. In the same amount of time that you might take to walk and get a cup of coffee, you've made a decision, kept others updated on important points, and reduced the overall inefficiency of the day. The time for small talk can be over lunch; use these drive-bys to distill your ideas into the length of an elevator pitch. This may be uncomfortable for some people as it requires checking your ego at the door, but teams that are able to adopt these policies can become much more agile. Always focus on the end result and what you need to keep your projects moving. This could be anything from an approval by a superior, someone agreeing to take on a task, or even consensus that you're heading in the right direction. Capture takeaways and next steps, and most importantly -- the name of the responsible party and when the result should be delivered. This will keep your meetings on task and team focused. The word 'meeting' doesn't have to be a negative concept. 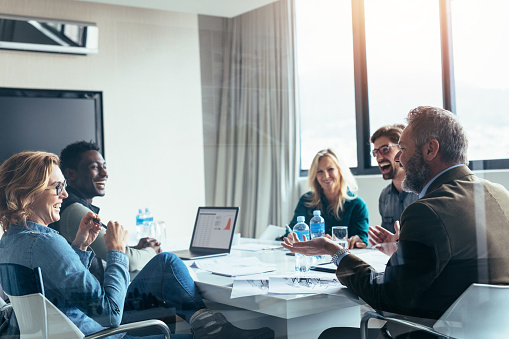 Instead, use these 5 meeting rules to adopt a culture of forward motion, positivity, and respect within the organization that will drive success both now and in the future. This isn't a one-time change to how you approach meetings, but an organization-wide initiative to take back your time and productivity.